Formula 1 returned to Europe at the weekend and the port of Valencia with its attractive and testing street circuit. This was the third time the circuit had hosted the European Grand Prix and after an intense qualifying on Saturday, an even more thrilling race followed on Sunday. Sebastien Vettel started from pole and was immediately under pressure from BRDC full Member Lewis Hamilton going into the first corner. Lewis, having passed fellow Member Mark Webber from the get away, then continued hounding the back of the Red Bull car in front before Sebastian’s blistering pace saw him pull out a healthy lead. Mark found himself in 9th place after the first lap after a rugged first lap that saw many cars using the run-off areas and touching wheels. Eventually he pitted for fresh rubber and emerged behind the Lotus of Heikki Kovalainen. Soon after coming back out on track, Mark ran into the back of the Lotus whilst slip streaming Heikki who hit the brakes. The collision threw Mark’s Red Bull skywards in a spectacular summersault before landing and sliding into the tyre wall. Fortunately Mark was ok, a testament to the strength of modern Formula 1 cars. During the safety car period that followed, Lewis was deemed to have overtaken the safety car itself and received a 10 second stop/go penalty. Luckily the Sauber of Kobayashi in 3rd had held the pack up and Lewis rejoined in second behind Sebastien. After Kobayashi eventually pitted for tyres on the 53rd lap, Jenson was promoted to 3rd and that is how it finished. 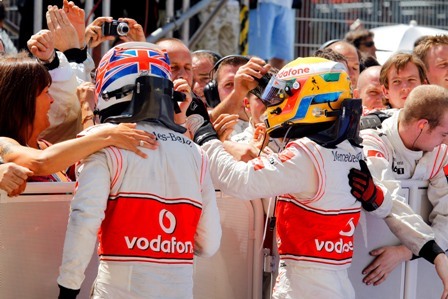 Sebastian took a deserved victory with Lewis 2nd and Jenson 3rd behind his team-mate. After the race the stewards penalised 9 drivers with 5 second penalties as they were seen to be driving to quickly under yellow flags on their way to get in the pits when the safety car came out. Only a couple of places were affected, fortunately Jenson kept his 3rd place. The result means that Lewis will be top of the Drivers Championship for his home Grand Prix at Silverstone and Jenson will remain second 6 points behind his fellow McLaren Driver. McLaren top the Constructors championship on 248 points ahead of Red Bull on 218 points.